Last night we headed out to see A Portait of Mary Vaux at ArtsPlace. A mountaineer before women were allowed to be mountaineers (and, really, being forced to tackle glacier travel in long, heavy wool skirts hardly made scrambling around in the Rockies any easier), Mary left quite a legacy of mountain writing, botanical drawings, photographs and precise scientific records of glaciers on the move. Balsamorhiza sagittata(arrowleaf balsamroot) This painting of Balsamorhiza sagittata (arrowleaf balsamroot) was done by Mary Vaux. Listening to Mary’s words written long ago reminded me just how lucky I am to live here. Poor Mary had to travel from Philadelphia whenever she needed a mountain fix! The mountains might have been misty, but the ice has mostly melted in the valley bottom. Occasional snowflakes flitted around as I wandered, lost in a mix of musing and meditation. Mellow. Mmmmm…. In keeping with the theme of women artists, botany, and the letter M, I’ll finish up with this one by Maria Sibylla Merian. It may not be much fun to have your feet whip out from underneath you when trying to navigate an icy sidewalk, but ice in its other incarnations is nothing short of stunning (it is also symbolic of transformation being, after all, the reincarnation of water…). I was reminded of this on the weekend when we headed out for a bit of spring ice climbing in Johnston Canyon in Banff National Park. Back in the farm days, ice was a major pain in the backside. Water buckets froze solid and it was an endless struggle to haul water by hand down to the livestock. Ice is something I never get tired of ogling. Aesthetically, it’s stunning the way ice catches the light, the way it’s always moving, forming and changing, the way it changes colour, the way it is simultaneously hard and unforgiving and fragile in a way that scares me to death. A couple of times a year in spring and fall, the edge of ice where it meets water is also symbolic of a seasonal transition. Soon, soon, we will be enjoying our annual spring melt here in the mountains. So far, though, it’s been a cold winter and for that the ice climbers (and skiiers) are grateful. What’s your favourite season? I’m partial to spring and fall when change is so obvious in every direction one looks it’s impossible to forget that all things are always in a state of flux. The only constant is change. 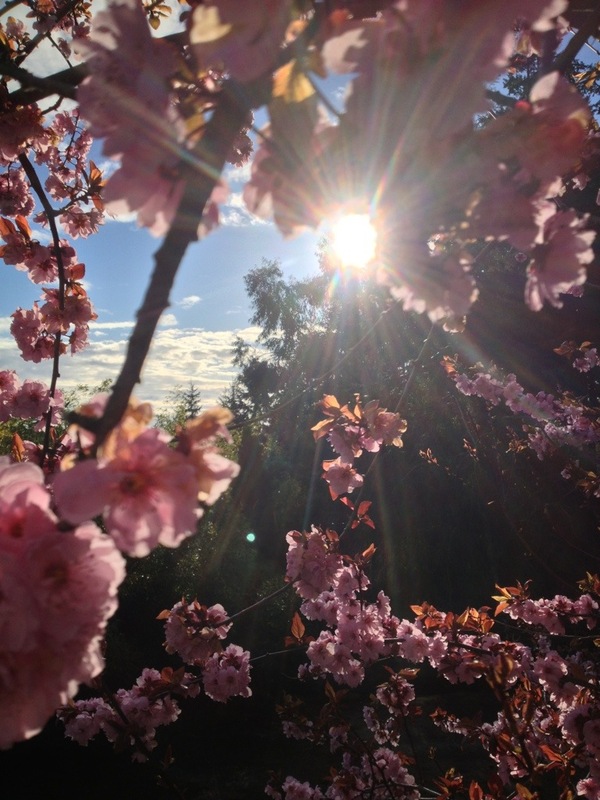 Blossoms and blue skies… signs that spring is really here. 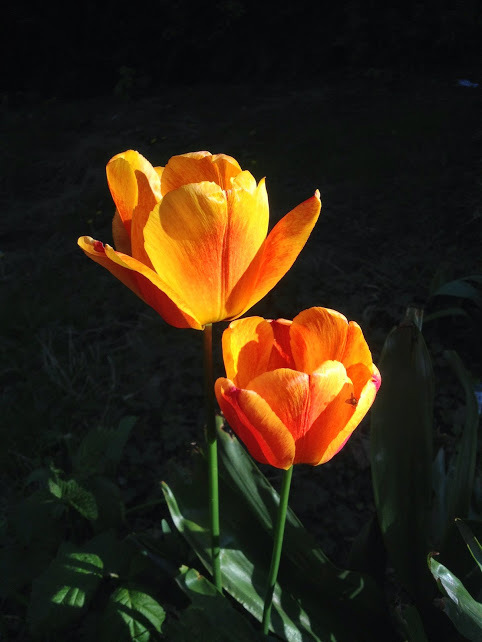 … gold, yellow, amber, orange – such a warm display from our cheery tulips, as happy to see the sun as we are. F is also for Finally! !